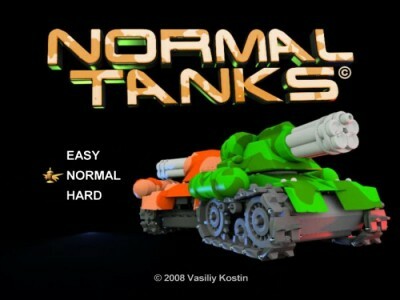 If you have no experience with the game, hearing the title “Normal Tanks” likely brings visions of fun gameplay involving massive metal war machines, destroying everything in their paths with mighty blasts. And, to an extent, you’d be right. There are tanks, and you drive them around and shoot things with them. Fun, though? Not so much. Normal Tanks is a short little mini from Beatshapers that throws you right into wartime action without so much as an explanation. One minute you’re pressing “start new game”, the next you are shooting everything that moves. That isn’t necessarily a bad thing in itself, as I think we can all agree that shooting things with tanks is generally the epitome of sheer awesomeness. But I do think it would have been nice to know a little bit of the motivation behind the whole thing, if even just a to the point “Kill the Nazis” or “The enemy army has captured your family” or even “The onboard computer has taken over control of the machines. SAVE YOURSELF!” But there is none of that. You don’t know why you have to shoot everything, you don’t know where you are supposed to go or what your goal is, and you don’t even know if you are a good guy or a bad guy. Call me crazy, but I like a little information. At first glance, I thought to myself “This would be a great game for my son.” After all, there are tanks, and they shoot things. The environments are pretty simple, consisting of maze-like areas to drive through that pretty much lead you where you want to go. All of that says mindless fun; great for the 7-10 year old set. And it would be. My son would love blasting through the place and shooting everything, and he would happily accept the idea of no storyline simply because it has tanks, and that’s all he needs. At first glance, it seemed like the perfect game for both kids and adults for mindless blasting fun. Alas, it was not to be, as the controls destroy that. Rather than go for a very simple control scheme, Normal Tanks uses nearly every button available to control your tank. 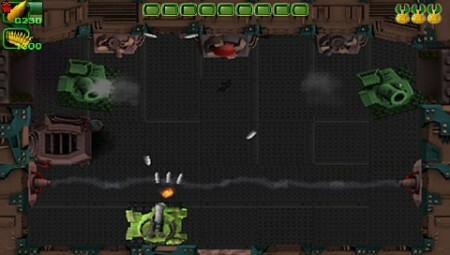 The directional pad controls the actual motion of your tank, while the “square”, “circle”, “triangle”, and “x” buttons rotate the direction your turret is pointing 45 degrees at a time. The left shoulder button switches between buttons, and the right shoulder button shoots. 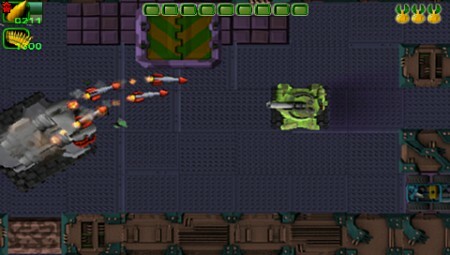 All of this is pretty clunky on its own, but adding in that the analog stick controls the auto aim feature “which instantly turns off as soon as you move your tank even slightly, and so must be pressed near constantly during combat) and you have a control scheme that makes it very difficult to both move and shoot at the same time. Staying still makes you a very easy target, and you have no shields. Moving and shooting means not being able to use auto aim, and controlling the turret manually is very imprecise. All of this makes for a control scheme that is too difficult for children, and unnecessarily frustrating for adults. Normal Tanks takes the engaging idea of shooting things with a big tank and makes it….not so engaging. The controls are frustrating, there is no story to speak of, and the environments are dark and rather uninteresting. I give Normal Tanks a 5 out of 10, and recommend it to tank enthusiasts who are not easily frustrated.